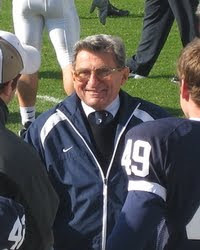 Joe Paterno is dead, and his tragedy is complete. Now all that is left to do is attempt not to speak too ill of the dead, and for some to urge us to remember the good of the fired Penn State football legend's life -- not just the inaction that doomed God knows how many young people to a fate scarcely better than death. Or perhaps worse than death, I cannot say for certain. As it turned out, negligence, shame and humiliation turned out to be the final chapter in the story of JoePa's life. In the movies, even Darth Vader got the opportunity to redeem himself in the end. The old coach did not. In the unblinking eye of history, his legacy will forever rest somewhere on the Dark Side. For every million dollars he gave to Penn State, for every heartfelt tribute by a former player, for any number of lives he impacted for the good -- for all these things there will be the damning counterweight of young lives wrecked and childhood innocence stolen because the most powerful man in State College, Pa., behaved as a befuddled coward when it really mattered. THE MYTH of virtue and greatness crumbled into ignominy, and then a disgraced old man died. In Star Wars, the dark lord got one last chance to make a crooked path straight and forsake the shadows for the light. Darth Vader got one last chance to argue for posterity -- for himself and through his actions -- that the sum of his sins did not exceed the good that remained. That, ultimately, Anakin Skywalker could not be subsumed. Real life often isn't so kind, even to a football legend. Joe Paterno never got to make a crooked reputation straight once more. It is left to his surrogates to beg history for mercy on his behalf. Let us be careful with every chapter of our lives. We never know which will be the last.